Shannon A. Thompson’s novel Take Me Tomorrow features a drug that makes its users temporarily clairvoyant. You can read the opening chapters here. Shannon A. Thompson is the author of the Timely Death Trilogy, a YA paranormal romance series. The first novel in the series, Minutes Before Sunset, was a Goodreads Book of the Month selection. 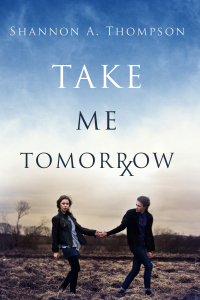 Her most recent novel is Take Me Tomorrow, a YA dystopian thriller. In this interview, Thompson discusses her growth as a writer since publishing her first novel at the age of 16, stretching the conventions of the YA dystopian genre, and the role of The Odyssey in her new novel. The chapters have real dramatic punch. Each begins in a moment of tension and ends with that moment ends. As a result, the chapters are often short and focused on a single scene. Do you structure them that way consciously? I never structure chapters to be a certain way. The breaks might change during editing, but I mainly focus on simply telling the story honestly and in the best way possible. In fact, I didn’t even realize that about the chapters until you said it. Perhaps that is just the way Sophia’s mind works. This is your fourth novel. The first one, November Snow, was written (I believe) while you were still a teenager. I’m sure it’s easy to see how you’ve developed as a writer since then. I’m curious what you think is the most significant way your writing has grown. I believe my writing has grown dramatically. It’s funny you bring November Snow up because it is currently being re-written for re-release in November of 2015, and even I can confess to the embarrassing moments (the endless moments) I’ve had evaluating the changes I want to make. My voice has become more concise, and my characters have grown in maturity and depth. I am very excited to see how far my stories have come over the past seven years, and I hope to continue growing for the rest of my writing life. The novel begins in the woods, with a female narrator running and throwing knives into trees. In other words, we’re in a world that owes some of its existence to The Hunger Games. Its dystopian world (with a tyrannical state apparatus) also sits firmly within the genre of dystopian YA literature. I’m curious how you view yourself as a writer in these genres. Some writers, like Tolkien and J.K. Rowling, take inherited creatures and stories and re-imagine them. Other writers—Suzanne Collins, to some extent—write within the genre without feeling the need to stretch it. What sort of writer do you consider yourself? Are you pushing at the conventions or working comfortably within them? Shannon A. Thompson’s YA dystopian novel, Take Me Tomorrow, is set in a region around Topeka, Kansas. Well, to be honest, I based the beginning off of my real life. I used to live on a couple hundred acres with my husky, Shadow (the inspiration for Argos) and I collect knives in my spare time. That being said, I strived for a more realistic viewpoint in my dystopian novel. The genre is saturated with almost unrelatable worlds, and although those are fantastically entertaining, I wanted Take Me Tomorrow to have a very close relationship with our current world because the themes very much coincide with societal issues of today, and I didn’t want the topics to be buried under a fantasy. Perhaps that is working comfortably within today’s lines, but maybe – in all honesty – it is pushing the conventions since the approach isn’t in dystopian literature as often. I leave that for the reader to decide. That being said, the sequel – Take Me Yesterday — reveals more about the world than the first book, and I am hoping it receives a contract in the near future. Too bad I don’t have tomo to know. The Iliad and The Odyssey are mentioned often in this book. To what extent do you look to those books and their monsters and plots, all of which remain freshly contemporary? Both of those stories are mentioned because Sophia really enjoys them. She has a daring soul and an adventurous heart, but the extent of their mention is explained more so in the sequel. That being said, I will point out one particular scene, which is a bit of spoiler, but in Noah’s bedroom, she comes across a statue, but she doesn’t recognize it. This has to do with Greek culture, and it also shows that – although Sophia reads – the government has censored a lot, especially in terms of photographs (hence why Sophia is fascinated by the paintings in Phelps’ mansion) so she doesn’t recognize what she is looking at despite the fact that she would be aware of it if she were alive in our world. 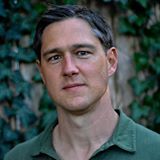 Those are very small details that I inserted specifically for the readers who experience novels more than once and for the rest of the series because Sophia ends up on her own odyssey, and the adventure exposes – like you said – many monsters.